“The apostles returned to Jesus, and told Him all that they had done and taught. 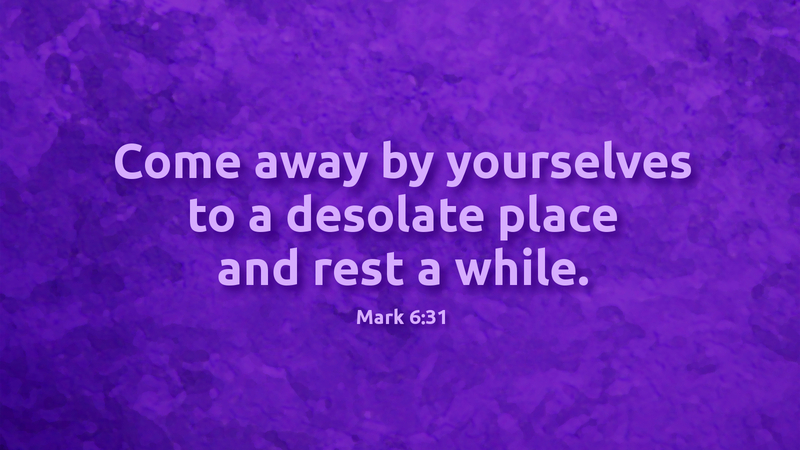 And He said to them, ‘Come away by yourselves to a lonely place, and rest a while” (Mark 6:30–31). If there is one thing most of us today are missing, it is the chance to “come away to a lonely place and rest a while.” Pastors often express concern and worry for members who are so over-booked, over-scheduled, and over-worked that their lives are out-of-balance. Ironically, the lives of pastors and their families are often no different. Many folks today find their lives out-of-control and are hard-pressed to know what to do about it. The apostles had just returned from being sent out by Jesus to preach the Gospel, to cast out demons and to anoint and heal the sick. In the next sentences of the daily reading, St. Mark tells us, “For many were coming and going, and they had no leisure even to eat.” Could that not be said about many of us—that we are so busy, we have to eat at our desks, or on the run? Isn’t it true that many of our families have no time to ever sit down at table together? Studies show that families who have evening meals together are healthier and stronger, and it makes teenagers less likely to abuse alcohol or drugs. And yet, many seem clueless as to what to do about the situation. Many don’t know how to slow down and re-orient their lives. The simplest way to begin is as Jesus bids the apostles: “Come away by yourselves to a lonely place and rest a while.” In other words, step off the treadmill, break the routine, get out of the rut so that you can rest and reflect. Of course, Jesus often took the disciples up a mountain or to a quiet place beside the sea. If you can’t schedule a retreat away from home, find a quiet place at home—or at the coffee shop for a mini-retreat—a brief time for reflection and re-orientation. Don’t make it too hard—but give yourself time to think about your schedule, your commitments and how you might begin to re-work your calendar so that there is more time for prayer, worship and devotion. And yes, it may mean saying “no” at times. It may mean the kids don’t do everything they want to do in life, but are limited to one or two extra-curricular activities. Getting away to a quiet place to rest will allow you to begin to re-think your busy-ness, and reset your priorities. Prayer: O Lord our God, in the midst of our crowded and busy schedules, help us to find time to rest and reflect, and so reorient our lives with you at the center, through Jesus Christ our Lord. Amen. Ashes to Easter is written by the Rev. Dr. David Wendel. For more information, please refer to the Introduction to the Lenten Devotional Booklet.